Before the 18th century, most successful magicians were European and white. Richard Potter changed all that. A magician, ventriloquist, and fire-eater, he is credited with being both the first American-born and the first black professional stage magician. A Very Big Rock in New Hampshire. Born the son of a slave in 1783, just after the Revolutionary War, Richard Potter had a long career as America’s first professional magician. Tall tales of his life abound: During his lifetime, rumors persisted that his father was Benjamin Franklin (unlikely, as Franklin had been in France for nearly a decade when Potter was born), and his dark skin caused many promoters to bill him as a “Hindoo” from the Far East. Potter’s performance featured acts of magic (“The Enchanted Cards,” “The Deceptive Ball,” and “The Magnetic Egg that dances a hornpipe”), fire eating (as “the Anti-Combustible Man Salamander”), comedy (a “Dissertation on Noses”) and ventriloquism. After a successful national tour, Potter settled in Andover in 1814, where he bought 200 acres of land and built a grand, two-story house. Legend has it that “the Potter Place” served as the inspiration for the design of the New Hampshire state house in Concord, built in 1819. Potter listed his occupation as “yeoman,” and he grew peas, rye, and flax, and kept herds of cattle and pigs. But he continued to tour and was one of Boston’s most popular performers into the 1820s. Well-liked by his neighbors (one said Potter was “as good a citizen as ever lived in Andover”), the area of Andover near his farm became known as “Potter Place,” a name it bears to this day. 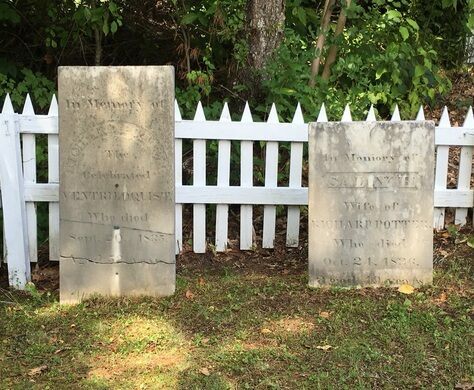 The graves of Richard Potter and his wife, Sally, are just behind the Potter Place Railroad Station and are maintained by the Andover Historical Society. The society published a short booklet, “The Magician of Potter Place,” which can be purchased at the JC Emons General Store and Post Office across the road from the station. The gravesite is accessible 7 days a week. The Railroad Station Museum and J.C. Emons General Store and Post Office have limited hours; contact the Andover Historical Society for details.From I-93:Take exit 17 onto US Route 4 westbound toward Boscawen and AndoverAfter 19 miles, turn left onto Depot Street.The Railroad Station building is about a quarter mile on the left, just past Cilleyville Road. Haskins, Jim and Benson, Kathleen. "Conjure Times: Black Magicians in America" New York: Walker and Company, 2001. Johnson, Paul E. "Playing with Race in the Early Republic: Mr. Potter, the Ventriloquist" The New England Quarterly, June 2016, pp 257-285. The massive Roman arch in New Hampshire that was meant to be a tomb. Nature and religion are reunited at this unconventional church in the forest.